Above is my contribution to Marvel's month of 'Venom Variants', featuring several staples of the Marvel universe 'Venom-ified'. 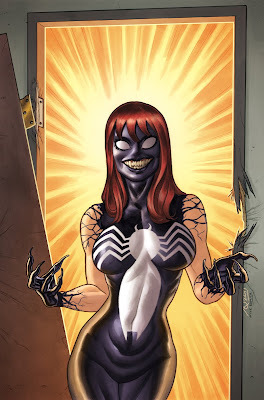 I was tasked with joining Mary Jane Watson with the infamous symbiote, and thought it'd be fun to reference her iconic first appearance from Amazing Spider-man no. 42, by John Romita. Mistakenly, I thought this issue came out today, but the internet has informed me that it, in fact, it hit comic stands last week. It's also a variant, so it might be hard to find, but keep an eye out the next time you find yourself at your local shop. If you have the original to the Mary Jane sketch please contact me at poconorob (at) gmail (dot) com.